There’s a little ghost that haunts the abandoned pier up at Eagle Lake. I know because I saw him last week, trundling up and down the dock, babbling to himself incoherently while Audrey and I were sitting down by the water’s edge. He probably drowned there. When people die violent, horrific deaths—the kind you read about in the news—the trauma often prevents them from escaping the physical world until they make peace with their past. Until then, they’re lost, stuck in between worlds looking for closure, or love, or contentment, most times completely unaware that they’re even dead. Sometimes, ghosts wander, but most end up hanging around the places where they died. That’s why those places are haunted. Take our little ghost for instance: he probably drowned in the water by the dock when he was little, maybe even too little to remember when it happened. Now he probably doesn’t even know that he’s dead. Or maybe he does, I don’t know. I’ve never talked to him. Audrey and I have been married for almost three years and the pier has always been our spot. She was my date for prom, senior year of high school. We ditched, and I drove us out to the lake, the light of the moon reflecting on the utterly bare surface of her upper arm the whole way there. That night, amid the whispering of the pines, we shared our first kiss. The boards creaked an ovation after the bullfrog philharmonic, featuring a hoot owl. We dropped out of college and got married, and the abandoned pier at Eagle Lake was more ours than ever before. There was no money, so we spent our honeymoon sneaking around town, finding all different places to practice the art of carelessness. Our favorite was the boat house at the end of the pier. It has a single, cross-framed window that looks out across the water. Inside, an old rowboat hangs from the ceiling, strung up by six whining ropes attached to iron hooks. There’s an old oar, leaning in the corner too. By now I’m sure the wood has rotted and the hooks are rusty, but back then, it was as sturdy as ever. Our child, Danny, was conceived in the bow of that boat. Back then, I assure you it was as sturdy as ever. For obvious reasons, I don’t want to share our pier with some invasive little ghost. Did I mention that one of the most important things to a ghost is his memory? I heard Audrey say that once. If he can’t remember what the circumstances were surrounding his death, or at least what happened during his final moments, he could go on living for years without ever realizing that he’s dead. The poor little guy is probably too young to even remember how he died. What a terrible way to go. After Danny was born, life changed for Audrey and me. We didn’t have as much time to escape to the pier as we had before, and carelessness was no longer an option. 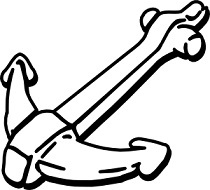 Responsibility sank in like an anchor, slowly drowning me in obligation. Audrey seemed to embrace it. She seemed to relish getting up four, five times a night, just to quiet our wailing hurricane of a son. It seemed I had traded our bliss-filled lifestyle for one of regiment and structure, and my wife for a mother. That bothered me. I wanted my Audrey back, and our carefree romps down at the pier. Talking to ghosts can be dangerous. You never know what they might tell you. They might remember how they died, where they were. That’s one reason why I don’t talk to our little ghost, because, the truth is, I can’t remember how my son, Danny, died. For obvious reasons, that makes me nervous. What I do remember is being in love with my wife. I remember burning with jealousy, alone in bed, over her newfound affection for our son. How she answered his every cry, and how I was left to myself—weary, neglected, and betrayed. I also remember cradling Danny in my arms, in the boathouse at the end of the pier, the pines shaking in disapproval, and the floorboards creaking with the warning of approaching footsteps. I’ve heard Audrey say that when blunt force trauma is the cause of death, the victim experiences memory loss. It wouldn’t surprise me to find Audrey wielding that oar in the corner, brandishing it like a club as it obliterated the back of my head, powered by rage and vengeance, hitting me again and again until she realized it wouldn’t be bringing a certain little ghost back to her. A certain little ghost who drowned in the water by the pier. I’m not saying that’s what happened, I’m just saying it wouldn’t surprise me. Part of me says I should talk to him, ask him what happened. Maybe then I’d be able to say with certainty that I didn’t kill my son to get my wife back. Maybe then Audrey would start talking to me again. Maybe then I could remember the truth about our little ghost. JT is a 21 year old college student in Virginia who lives and writes in worlds of his own. His work has appeared in Nanoism, 365tomorrows, Cease, Cows, and now here.